Dunsfold airfield in Surrey is this year celebrating its 70th birthday. It spent most of it life surrounded in secrecy and it was only in the 1990’s that the goings on there has come to light. Used initially by the Royal Canadian Air Force during the war, it later saw the repatriation of some 47,000 prisoners of war. 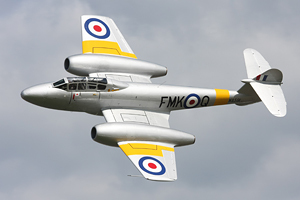 After being used by Air freight company Skyways, the airfield passed into the hands of Hawker aircraft limited, where aircraft such as the Hunter were developed. This in turn then formed part of the BAC company and later another amalgamation of British aeronautical companies, BAE systems. Types such as the Harrier and also the Hawk were also developed at Dunsfold. In 2002 Dunsfold park ltd took over and now run a successful business park on the site. 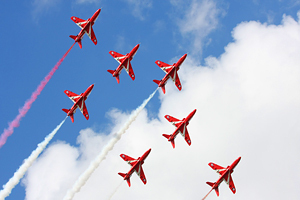 BBC’s Top Gear is filmed at the airfield and it is also home to the firmly established Wings and Wheels show. 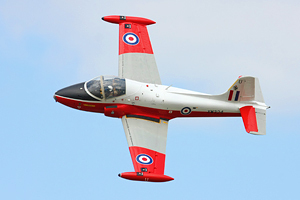 August 26th and 27th saw the eighth Wings and Wheels airshow. With the weather looking promising on the Sunday, the airfield certainly seemed packed. I attended the show on this day and was very impressed. 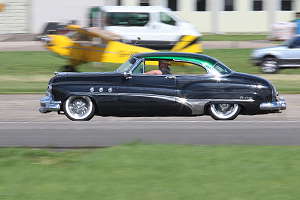 This was the third Dunsfold show I have attended , and it just gets better and better each year. Separated out into different ‘Zones’, there is something for everyone. Whether it be 2 wheels or 4, Helicopters or Planes, Military or civil, the show has it covered. In the static park, Brooklands museum had brought along their Sopwith Camel. At times in the day she was fired up to give a ground running demonstration. Along side her in the static was a Merlin helicopter from RAF Benson and also both Mk’s of the Air forces Hawk trainer. Pilots and ground crew were on hand to give people the low down on the militaries finest assets. 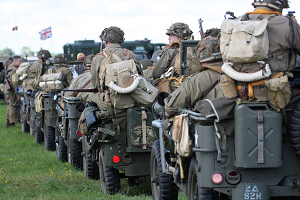 Walking down the airfield there was an impressive range of 1940’s military vehicles (complete with plenty of re-enactors) in the ‘40’s Zone’. Hotrods galore in the ‘Hotrod Zone’ and a great stunt show in the ‘Stunt zone’. Another nice touch is being able to get up close and personal with many of the participating cars and motor bikes in the Paddock. Owners are more than happy to talk about their pride and joys. The show officially kicked off at 10am with a parade of the Military vehicles along the crowd line. There were Willys jeeps as far as the eye could see. I was particularly impressed with a 1943 International M5 Halftrack. Following the parade, cars and bikes to the track for fast runs along Dunsfolds runway. A highlight for myself (and many other) was the appearance of 83 year old John Surtees. Surtees is the only person to have won World championships in both 2 and 4 wheel racing. He took his 1953 Vincent ‘Black Lightning’ shooting down the runway, and he wasn’t hanging around either!!! 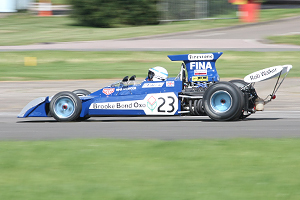 One of the Surtees F1 cars also ran down the runway . This was the 1972 TS14. Other notable cars were the Napier Railton aero engined car and , for its 2nd year the 1988 Porsche 962 LeMans car. 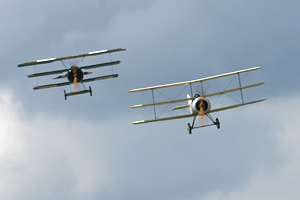 With the end of the mornings first outing for the motor vehicles, the airshow was opened by two Triplanes. From the British side we had a lovely Sopwith triplane replica owned and displayed by Gordon Brander. He came under attack from the infamous mount of the Red Baron, A Fokker triplane. Complete with smoke, the two triplanes chased each other around the sky in a thrilling dogfight, Brilliant!!! 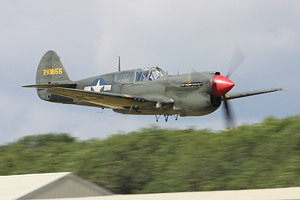 Peter Teichman then followed in his first aircraft display of the day, The P40 Kittyhawk. This aircraft is still painted in the colours she wore in the filming of the recently released ‘Red Tails’ movie. The Tiger Club was created in 1956 by a group of pilots who wanted to race Tiger Moths. 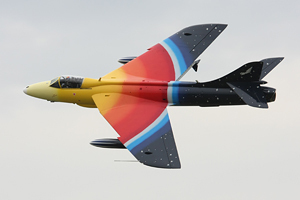 It rapidly grew which brought new types into the club, displaying at many air shows across the country. 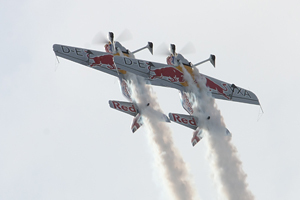 The club operates 4 Turbulent aircraft, performing daring stunts to wow the crowds. First up was the limbo. With bunting tied between 2 poles, the aircraft took it in turns to fly under the rope. After surviving this, the pilots then took to ‘Flour Bombing’ a small target on the airfield. Most amazing of all was the balloon popping. 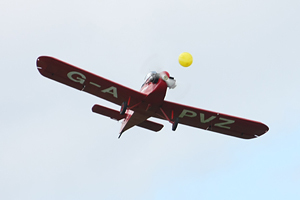 Each aircraft managed to pop a balloon which had been released from the ground. 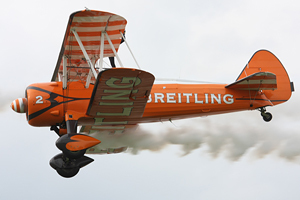 A truly entertaining display and it took you back to the vintage days of air displays. 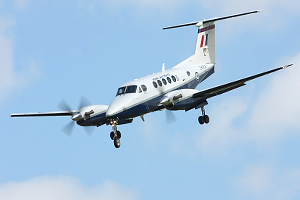 The first aircraft from the RAF to display was Flt Ltn Ian Birchall in the Light transport aircraft, The King Air. He performed a short display showing how manoeuvrable the King Air is. He finished with a Tactical approach landing, coming to a short stop on the runway and showing of the ‘reverse gear’ that the King Air has. Following on from the King Air was Dan Griffiths in the Coventry based Meteor T7. The weather was great at this point, giving great exposure for the ‘Meatbox’ Dan brought the Meteor across the airfield in a series of low topside passes, excellent for us Photographers!! 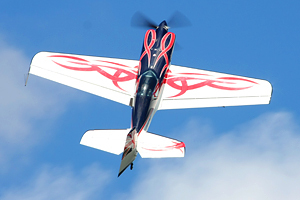 The Sbach 300 has been developed with unlimited aerobatics i9n mind. It is made from a carbon composite and it is said that the aircraft will perform anything a pilot can think up. In the hands of Gerald Cooper, we were given a glimpse of its capabilities. It is hard to find the words to describe Gerald’s display. He performed so many flips, rolls, slides, bunts it was hard to keep up!! Commentator Brendan o Brien did a fantastic (and very enthusiastic) job of keeping the crowd informed of the manoeuvres being completed. It was truly awe inspiring and was definitely my favourite display of the day. For more info on Gerald and a video of one of his routines, check out www.geraldcooper.com. 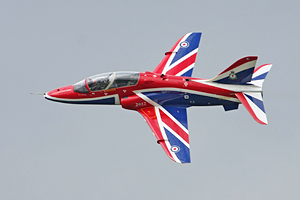 Operating from their birthplace of Kemble, The RAF’s Red Arrows entered from crowd rear. Flying a 7 ship this year, due to the tragic accidents of losing two pilots last year, the crowd were not disappointed. As ever the Reds flew an immaculate display. Due to airspace restrictions because of the close proximity to Gatwick, we did not get the full display. A nice touch and great tribute to Flt Ln Sean Cunningham and Flt Ln Jon Egging, was a formation pass in honour of the 2 pilots. This followed a rapturous applause from the crowd. Next year will see the Reds revert back to a 9 ship. 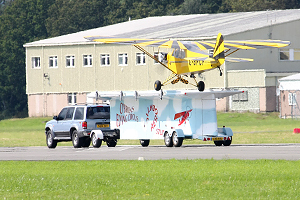 More stunning airmanship was seen after the Red Arrows by Brendan O Brien and his trailer top landing. Brendan managed to land his Cub successfully on top of a trailer towed behind a car, described as ‘the worlds smallest aircraft carrier’!! Jet Provost G-BWSG displayed next with some lovely aileron rolls and topsides before the smartly painted Hawk T.1 from the RAF closed the first half of the airshow. Once again the motor vehicles side to the show took to the track. 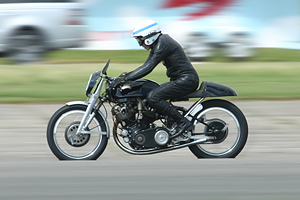 As before John Surtees Took his Vincent down the runway followed by the early sports cars. To open the second half of the air display, the BBMF entered from crowd rear. 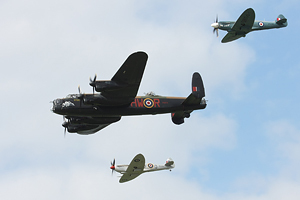 Avro Lancaster PA474 was flanked by Spitfire MK9 MK356 and MK14 PS915. Both Hurricanes are currently undergoing maintenance. 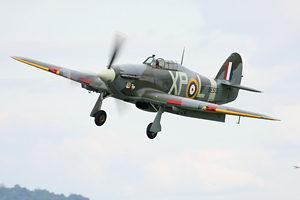 The flight will soon have a sixth airworthy Spitfire in the form of a MK LF XVIE (TE311). This was followed by a parachute display by the Tiger Team, who offered a drink to anyone who caught one of the woodies dropped to give info on the wind conditions. Unfortunately I think the woodies dropped on top of a large camper van!! 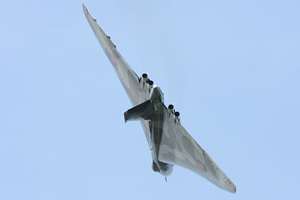 Unbelievably, The mighty Vulcan managed to sneak in from the right to start its display. In the Pilots seat was Kev Rumens, with Falklands veteran Martin Withers DFC as co-pilot. Kev certainly put on a stunning show culminating in a steep climb and a hard bank, which many people (including myself) believed we were about to see the Vulcan roll!!! Unfortunately she didn’t, what a sight that would have been. I think that was the best display I have seen Vulcan do . 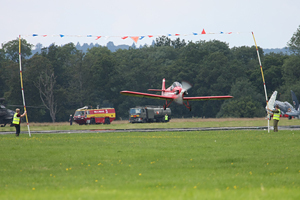 Well done Kev….. More top notch aerobatics followed with Paul Bonhomme and Steve Jones in their Sbach300’s, The red bull Matadors. 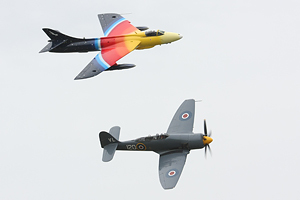 OFMC’s P51 and Spitfire are firm favourites across the country. 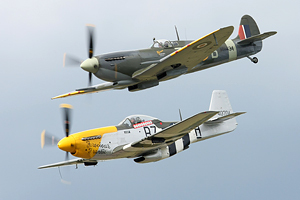 Brian Smith in Spitfire MH434 led Alistair Kay in P-51 Ferocious Frankie in an amazingly tight tail chase. It was a true master class in formation flying. Pete Teichman flew his second display of the day in his immaculate Hurricane MkIIB. This was a lovely flowing display and the Merlin engine almost sounded soft compared to the Mustang and Spitfire from OFMC. This year sees the 100th anniversary of the start of the Royal Flying Corps (RFC). 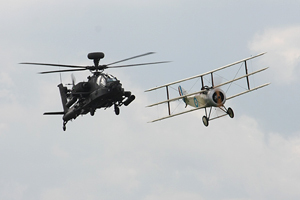 Who would ever have believed they would see a Sopwith Triplane fly in formation with an Army Air Corps Apache Helicopter. 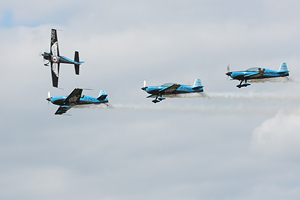 This was a truly unique formation and a big well done to Dunsfold’s organisers for bringing it to us. I think other air shows should look at adding some unique formation passes to their displays. After one pass the Triplane landed leaving the Apache to show off its versatility. Next year Army Apaches will be stationed in Afghanistan again. 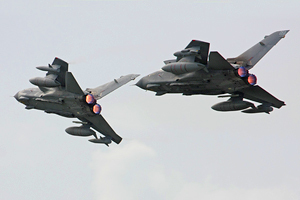 2 Tornadoes from XV Squadron appeared from the dull light to rid Dunsold of unwanted guests on the airfield. The RAF’s GR4 role demo is a popular display and didn’t disappoint. My only comment was the fact that the pyros seemed a little out of sequence, but you cant beat a tornado fast pass followed by a loud bang!! Once rid of enemies Dunsfolds skies were once again safe for the gorgeous girls of the Breitling Wingwalking team.